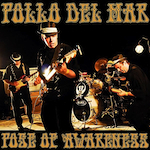 "Pose Of Awareness" is a new digital single from one of my favorite bands, Pollo Del Mar. recorded last year, and finally seeing the light of day, this song is a monster of psychedelic surf, Echoplex playtime, and soaring guitar lines. "Pose Of Awareness" is finally committed to tape in-studio. This superb song is a must have. It features a fine melody riff, intertwines muted surf glory, long sustain, and impeccable stinging whammy! Drama and psychedelic art married with children. Simply grand!